Next, we will need to display the popup. We can do this by handling the mouseenter event for the airport layer. This event will fire every time the mouse enters inside the bounds of one of the features on this layer. In other words, every time we move our mouse over one of the small green circles indicating an airport on the map, this event will fire. Information about the feature will be passed in the event arguments. 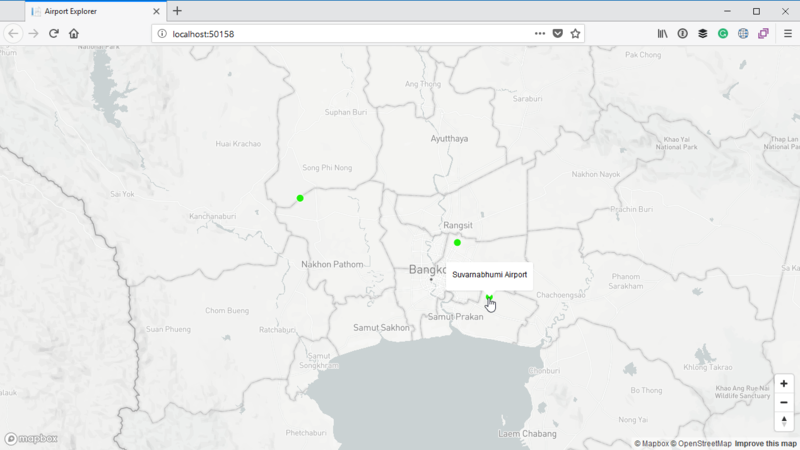 We can then use the feature’s coordinates to indicate where the popup should be displayed, and also retrieve the name of the airport from the feature’s properties we added before when we returned the feature collection. We can also handle the mouseleave event for the layer, which will fire every time the mouse leaves the bounds of one of the features on this layer. In this instance, we will remove the popup from the map.